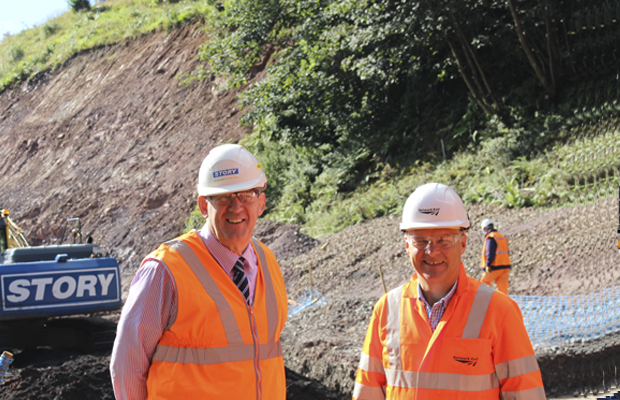 Fred Story, Chief Executive of Story Contracting welcomed Mark Carne to Eden Brows emergency works site in Armathwaite Cumbria recently to see first-hand the repair works and the progress that Story Contracting are making to ensure the line is open again to trains in the new year. Extensive ground investigation works have been undertaken to build up a profile of the embankment and the geology beneath the line area. As the work progresses a close eye is being kept on the land movement by means of aerial surveys and ground monitoring. Progress is continually being made at Eden Brows despite the huge challenges faced due to the 500,000 tonne landslip. Philip Middleton, Network Rail’s Scheme Project Manager said: “Designing and safely implementing a structural solution on a moving embankment has definitely been the most challenging aspect of the repairs. Story Contracting is building a concrete-and-steel structure that will sit buried beneath the railway, set into the hillside 70 metres above the River Eden. Two rows made up of around 230 high-strength piles – steel tubes filled with concrete – will be driven into the sloping bedrock of the Eden gorge, on which the 1.5 metre-thick, 100 metre-long concrete slab will then be placed as the base for the tracks. The piling work will take place four metres below rail level, which has required tonnes of material to be removed. The unloading of the embankment also helped to stabilise the slippage. Work is progressing well and is expected to be finished in late March 2017.